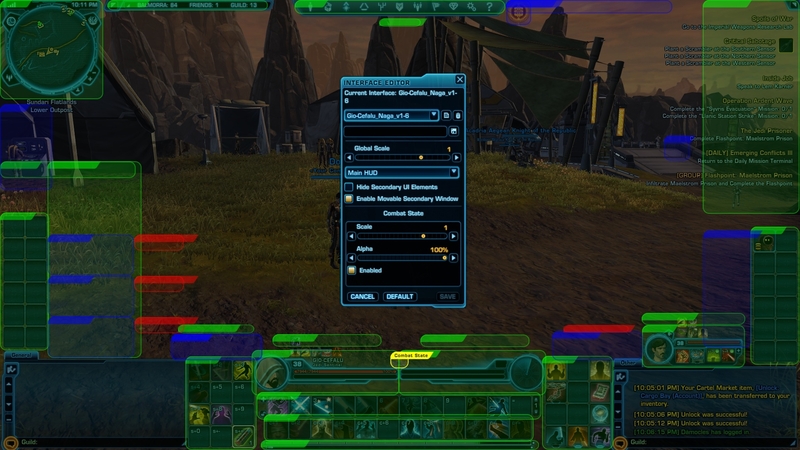 This is my standard "MMO" UI for the most part. It's used on 1920x1080 resolution. I try to keep the center and top clear of UI elements so you can see the action better. Chat windows are at the bottom left and bottom right; chat windows at the top can block characters/faces during cut-scenes (I have the cut-scene dialogue in my chat boxes), so I have them moved to the bottom. Hotbars are all moved to the bottom so if there are any that don't have hotkeys, they are all centralized (instead of having to click all the way on the left or right side of the screen). Also by having them in the center, you can easily see cooldowns. Party and companion elements are a little closer to the middle for easier targeting. Health of Target is enabled as well. Updated: Realized I left the companion cast bar under the left chat window. I moved this just over the companion toolbar and took 2 more screenshots to reflect this and to show the companion and companion toolbar in use. Update 4-13-12: I adjusted my UI a little to make more sense for Naga users. Now the hotkeys match up better with the orientation of the Naga. It's 3 across by 4 down instead of 4 across by 3 down. I had to shift the Focus Target and Target of Target up just a little to accomodate this, and I also made the chat windows a little bit wider. I also adjusted the global scale back to 1 but shrank down some individual windows like the party windows. It's still a lot tighter and cleaner than the original UI, but now the hotbars are a little bigger than before (by .05) so it's easier to see (at least by my old eyes for global cooldowns or if you happen to be a clicker. Older versions should be archived. Update: 4-16-12. I adjusted the UI scale of the mission tracker from 1.0 to 0.9 so it's taking up less space now. It's still easily legible, but less intrusive to the center of the screen, so it's a bit "tighter" now. Update: 4-19-12. I moved the Ops frames up a little to avoid collision with chat frame. I also extended the height of the health bar in the Ops frame (for easier healing) and added Text to Ops, player, and target frames. Update: 5-14-12. Minor update. I noticed the player window and target window were slightly off, so they were not symmetrical. I know this is very minor, but it was irritating me, so I adjusted it so that it should be very close to symmetrical now. Update: 7-9-12. Minor update. I found the response wheel was too low, so it was blocked by the player and target portraits. I raised it up a little so it's completely visible again. Update: 9-23-12. Minor update. I found when running FPs that the target window was too low, and the ToT window was interfering, so it made it difficult to see the difficulty of the mob (strong, elite, champion, etc). I adjusted the lower right chat window down slightly. I raised the Player and Target windows slightly, so now you can easily see the difficulty of the mob, and all of the shifts were minute. Update: 9-23-12. Ok, I was just kidding about the last update. 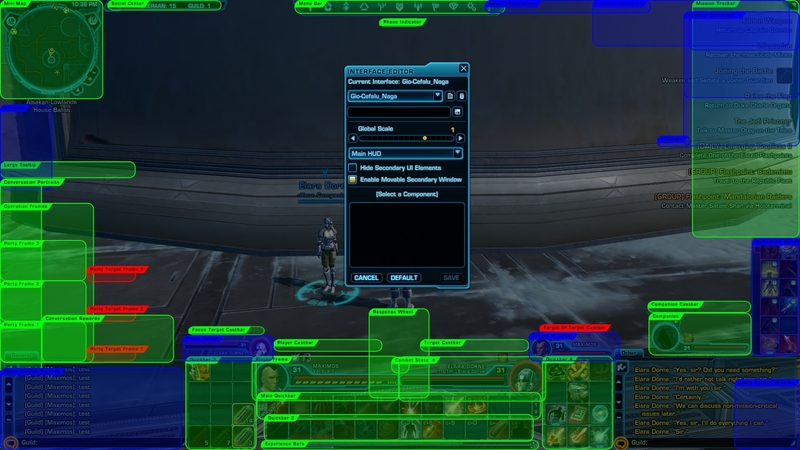 Now that I've moved the chat window lower on the right, I also lowered the companion bars to match it. Update: 11-16-12. Update for release 1.5. Added 2 additional hotbars, one on each side. Moved the companion bar in to accommodate the right hotbar, and move the party and ops window on the left a little more in to accommodate the left hotbar. Left the Cartel icon in the default location. Realized my Combat Awareness indicator was slightly off center, so I adjusted this. Added 2 screenshots as well. Update: 11/26/12. The "General" tab/window should be the main window, but it defaults to "Other" each time I log in (this has been occurring for a while now). I previously submitted a bug report about having a "default" window, and CS admitted this is a bug, but I suspect it is low priority for them. I went ahead and submitted another bug report to them today to see if they will escalate. For my UI, I swapped the "General" chat window and the "Other" chat window so "Other" is on the left and "General" is on the right. 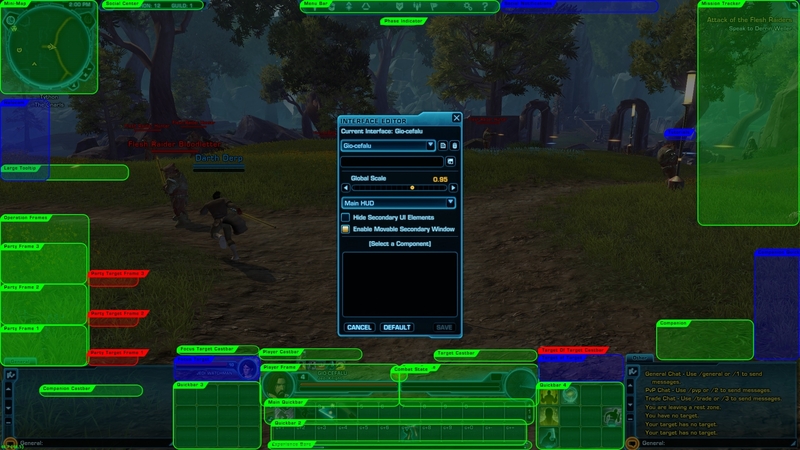 As others have mentioned, the "Other" chat window becomes the default when you log in or load screens, so you have to set focus to the "General" window each time. This is a pain for many (myself included), so I decided to switch their positions. This means that you'll need to adjust which chat channels you want in each window/tab so they are opposite of what they are now. Update: 11/27/12. Another user mentioned the Ops frames kept resetting, so I ran a few WZs to check it out. Sure enough, it gets pushed up after you load/zone. I don't know why this is happening, but I will /bug it in game. I don't do a lot of WZs or Ops, so I didn't notice this right away. I did make the Ops frames wider and shorter instead of tall and skinny so it's easier to click for healers and generally closer to the rest of the UI. 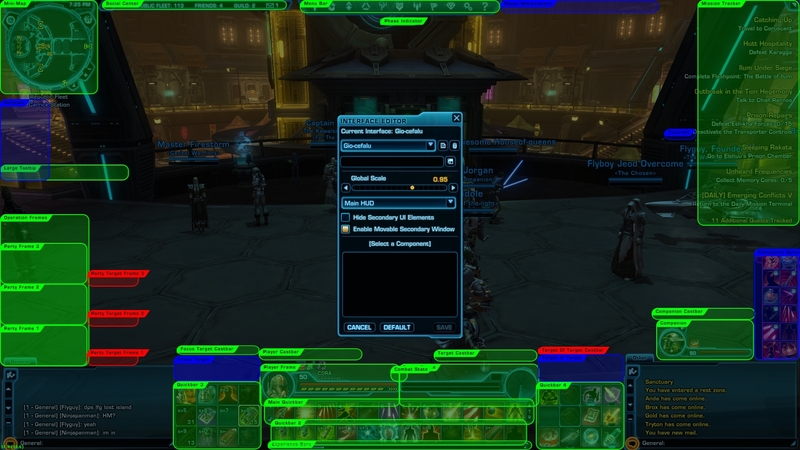 I also moved the HuttBall score panel so it doesn't interfere with your mission tracker. Update: 4/21/13. Adjusted the caster bars slightly up. If you have 2 rows of buffs, they were overlapping, and you can see a weird graphical bug during casting. Now that 2.0 is out with Achievements, I also moved the Achievements frame to the top left next to the map. Inverted it so that it's actionable component is at the top instead of the bottom. 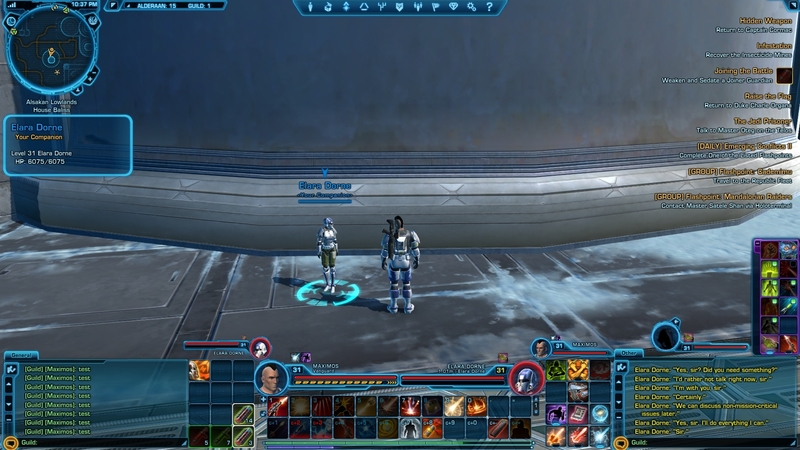 Do you still play SWTOR, Gio? Any update or tweaks to your UI since the last version? Hey guys, sorry I haven't really updated in a while. 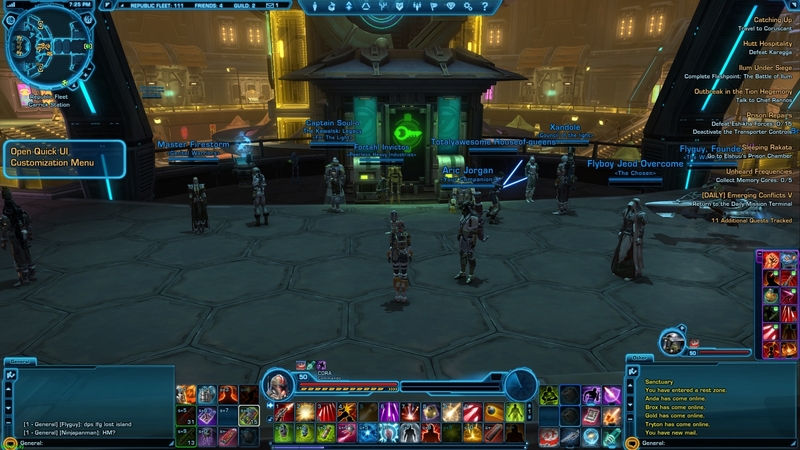 I don't play SWTOR anymore, but still miss parts of the game. I did get an itch to play when I saw the latest updates about the Revan expansion. 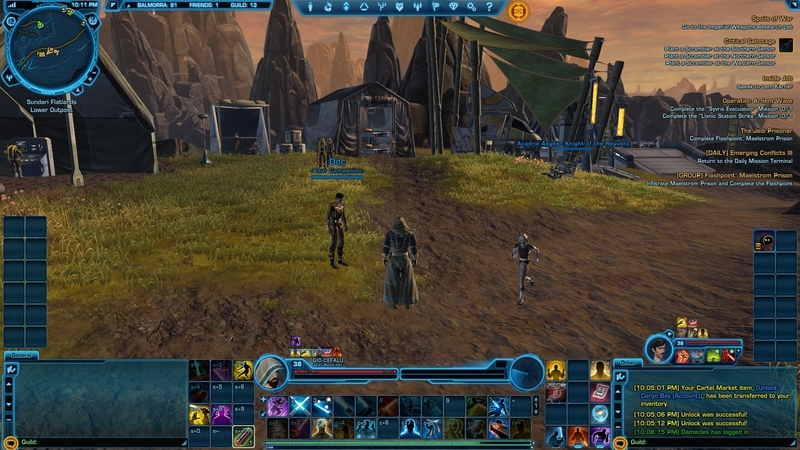 If the UI is outdated and needs some adjustments, let me know what you're looking for, and I'll re-download SWTOR so I can touch it up. Are there new UI elements that need to be placed? There's not been much since your last update, Galactic Strongholds, but that didn't add all that much in the way of UI stuff. Is there a reason why the UI isn't smaller? I'm not sure I understand what you're asking. Are you asking why all of the frames and overall scale are as large as they are? If that's what you're asking, then that's just what I felt looked and felt good so I could still see my UI without blocking my view of the game. I know some guys like a really tiny UI, but my vision is not that great, so personally, I might like the UI a little larger so I can see it better. Any chance of an update now 2.0 is out? Sorry for the slacking here. I haven't had time in my schedule to play much lately. Let me get my taxes done this weekend, and then I'll hop on and update the UI. I did notice that the chat boxes show the chat in left side but defaults to typing on the right box (when I hit enter it opens a chat bar on the right box but the chat is on the left). Is this what you designed the ui to do? This is a bug that I've submitted to BW, but I have not been given an ETA. Currently, there is no way to choose a "default" chat window/tab. In v1.7 and v1.8, I swapped the 2 chat windows around so that the default chat window is on the left, but you will notice the left window is now called "Other" and the right window is called "General." In my case, I set the right window (General) to only keep up with System channels, and the left window (Other) keeps up with all other types of chat (guild, general, party, ops, etc). I would definitely wait until the game has finished installing before adding in the UI. You will want to put it into this directory: C:\Users\USERNAME\AppData\Local\SWTOR\swtor\settings\GUIProfiles where USERNAME is the profile that you log in with. If you go to C:\Users first, then you'll see the list of users in the list if you aren't sure what your username is. You will receive a message that 'USERNAME' is not a valid command. The part in single quotes will be your user profile that you'll want to go to in the directory above. Feel free to PM me if you're still having any issues. Now fixed in the patch on 24/04/2012. I think I read on the forums somewhere that it was a bug as someone else was having a similar problem, so I'll look into it. I'll see if I can get it to change on my end, and then I'll let you know. So, it looks like it's definitely a bug. I would submit a bug report in game. I'll submit one as well. 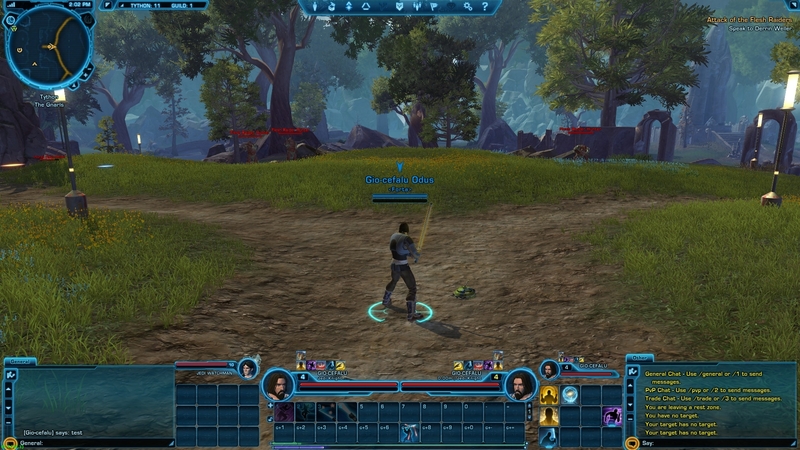 BioWare has stated that they look for the number of people who report a bug to help them decide the order in which to fix them (but that's not the sole factor). Just one minor issue I have. The right chat window "Other" the font size is always 14. Even if I select 12 it will not change. I have edited the XML so all chat windows have a font of 12 but no change on the right window. Any ideas or is this somthing you can't change?